In 1926, Sir Arthur Conan Doyle penned his last Holmes tale, The Adventure of the Retired Colourman. 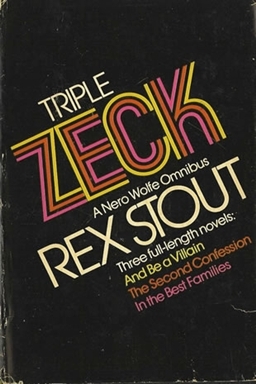 Rex Stout, a fan of those tales, would shortly create a detective who would not only evoke memories of Holmes, but who would cast his own (gargantuan) shadow: Nero Wolfe. The seventy-four stories, written over forty-one years, would be collectively known as the Corpus, akin to the Sherlockian Canon. 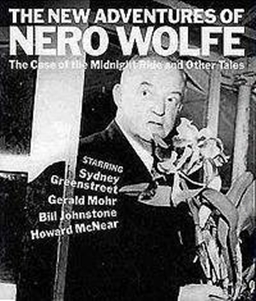 Nero Wolfe lives in a New York City brownstone with Archie Goodwin, Fritz Brenner, and Theodore Horstmann. This boys’ club (Wolfe makes Holmes look like a romantic) is a self-contained unit, with Wolfe and Archie solving crimes, Fritz cooking and taking care of the household chores, and Horstmann assisting Wolfe with his hobby, the cultivation of orchids in a rooftop greenhouse. Archie often comments on the beauty of the orchids, which is a far cry from the thoughts of General Sternwood in Raymond Chandler’s The Big Sleep: “Nasty things. Their flesh is too much like the flesh of men, and their perfume has the rotten sweetness of corruption.” Po-tay-toe, po-tah-toe, I guess. Because the characters do not age, the stories all have a comfortable familiarity about them. Also, they are set contemporary to their writing, so while in a Holmes tale, it is ‘always 1895’, the Wolfe stories feel much more like modern mysteries, even though some are over seventy-five years old. No, You Mean My Brother – Nero Wolfe bears a much stronger resemblance to Mycroft Holmes than to his more famous brother, Sherlock. Archie frequently tells us that Wolfe is lazy, and in fact his boss prefers to takes cases only when financial necessity dictates. Archie tells us that one of his most important jobs it to browbeat Wolfe into working, which is certainly indicative of the latter’s attitude towards accepting clients. Sherlock Holmes says that his brother would rather be considered wrong than to exert the necessary energy to prove himself correct. Wolfe may not quite take things that far, but he will do his utmost to avoid taking on a case. Regarding a murder, he once said, “I am not interested, not involved and not curious.” Unless forced by circumstances, that pretty much sums up Wolfe’s attitude towards work. Physically, Mycroft is described by Watson as ‘corpulent,’ which means having a large, bulky body. Wolfe actually uses the word ‘gargantuan’ to describe himself, and while his weight varies over the years, under normal circumstances it is in the neighborhood of 285 pounds. Both Wolfe and Mycroft are very large men, but with extremely agile minds. One thinks of Sidney Greenstreet’s ‘The Fat Man’ in The Maltese Falcon. In fact, Greenstreet actually voiced Wolfe in a series of radio plays starting in 1950. In Fer de Lance, the very first story, Wolfe is unfamiliar with the sport of golf. He has some clubs brought to his office and asks the delivery boy to demonstrate them for him. After watching a powerful swing, Wolfe mutters “Ungovernable fury.” Only a man who detests unnecessary physical exertion would view a simple golf swing in that vein. Wolfe considered venturing outside the brownstone as something to be avoided in the extreme, with only three events regularly drawing him forth: voting, dining at Rustermans (the restaurant owned by his boyhood friend Marko Vukcik), and pursuing his orchid obsession. Other sallies forth were dictated by circumstances and universally disliked. Wolfe viewed riding in a car akin to a suicide mission. Both Wolfe and Mycroft are men of habits. Six days a week, Wolfe takes breakfast in his room, dresses in exactly the same fashion, spends two hours in the morning and two more in the afternoon upstairs in the plant rooms, has lunch and dinner in the dining room at set times and only deals with business matters in the office if he absolutely must. When Wolfe enters the office for the first time, he greets Archie with a “Good morning,” even if they have already spoken. Fritz must not open the beer bottles he brings to Wolfe, who does it himself, using a specific bottle opener each time. Few detectives follow as rigid a daily pattern as Wolfe. Mycroft ‘has his rails’ and only frequents three places: his lodgings, his government office, and the Diogenes Club. Sherlock wonders what upheaval could have unsettled Mycroft’s habits so much to force a visit Baker Street. He compares it to a planet leaving its orbit. “Give me your details, and from an armchair I will return you an excellent expert opinion. But to run here and run there… it is not my métier.” Though this was Mycroft himself, talking to Sherlock, it could very well have been Wolfe talking to Archie. But similarities are not limited to only Mycroft. Moriarty? No, Zeck – Professor James Moriarty was Sherlock Holmes’s great nemesis. The detective got the better of Dr. Grimesby Roylott, Charles Augustus Milverton, John Clay, and many others, but it is Moriarty who is THE villain in the Canon. There is only one adversary who appears in multiple stories in the Corpus, and he is clearly the most dangerous man Wolfe faces. Three times Wolfe comes into contact with Arnold Zeck, who, like Moriarty, is the head of a criminal organization. Also like Moriarty, Zeck tries to warn the detective to stay out of his business. Failing, he has Wolfe’s greenhouse destroyed with a barrage of machine gun fire. Later, he sends a tear gas bomb to Wolfe’s office. Just as Holmes fled 221B Baker Street, Wolfe simply abandons the brownstone and goes deep undercover: Archie doesn’t even know where he is. Holmes stayed in hiding until the opportunity arose to get Moriarty’s chief lieutenant, Colonel Moran. Wolfe engaged in a similar ploy, slowly, anonymously, working his way into Zeck’s organization. When the timing is right, Wolfe sets a trap for his foe, just as Holmes did for Moran. War Service – During World War I, Holmes came out of retirement to go undercover and break up a German spy ring. In World War II, Nero Wolfe essentially sets aside his private practice and works for the Army. In Booby Trap, we watch Wolfe and Archie solve a wartime industrial espionage case fraught with murder. Wolfe and the Holmes brothers are both great patriots and serve their respective countries. Archie! – It can be argued effectively that Sherlock Holmes would have done just fine without Watson. While the good doctor was a more than capable chronicler, Holmes could probably have completed his investigations without Watson. Things might have been more difficult, but a successful conclusion would likely have been reached, nonetheless. This is partially because Holmes was a very energetic and physically capable detective. Nero Wolfe most certainly is not. Archie does all of the legwork. Well, not quite all; he does have assistance sometimes. However, Wolfe, quite simply, does not investigate. He thinks and he issues orders. Archie is a far more capable sidekick than Watson. He is, in fact, a licensed private investigator in his own right. When Wolfe disappears as part of his campaign against Arnold Zeck, Archie sets up shop on his own and does quite well. Archie is brave, wisecracking, attractive to women, athletic and tough. He is a detective in the style of Sam Spade and gumshoes in the pages of Black Mask Magazine. In fact, Wolfe is an intellectual detective in the Sherlock/Mycroft era, while Archie is typical of the hardboiled genre. Thus, Rex Stout created a detective series that was characterized by the two periods of detective fiction which bookended the Golden Era of mystery stories (of which Agatha Christie is a prime example). Perhaps it’s in the Blood? – Sherlockians have oft speculated that there was a romantic relationship between Sherlock Holmes and Irene Adler, with several films and pastiches utilizing the premise. 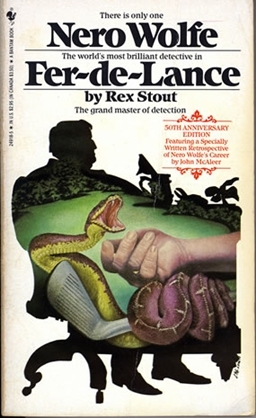 John Lescroart wrote a pair of novels featuring Auguste Lupa (a name with linguistic connotations of Nero Wolfe), Son of Holmes and Rasputin’s Revenge. The brilliant Lupa is the offspring of Holmes and Adler. Though it is never overtly stated, it’s hard not to conclude that Lupa, who heads off to America with his Swiss chef, Fritz, at the end of the second novel, becomes Nero Wolfe. In fact, it’s elementary. Now, don’t get the impression that the Wolfe stories are just pale copies of the Holmes tales. Rex Stout excelled in both plot and characterization and the Wolfe stories hold a unique and enduring place in the mystery pantheon. But Stout was a well-known fan of Sherlock Holmes and traces of that admiration and respect for the world’s first and greatest private consulting detective can be found in the Corpus. Very Satisfactory – If you have only a passing acquaintance with Nero Wolfe, you would do well to read up on the Corpus. 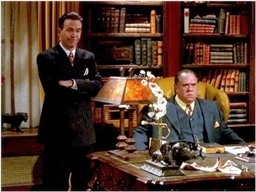 For the more visually minded mystery lover, there is also a Nero Wolfe series available on DVD. It aired on the A&E network in 2001 and 2002 and features Maury Chaykin and Timothy Hutton. Hutton, in particular, excelled, also serving as director and executive producer on the series. It is a high-quality production with an excellent jazz soundtrack and happily, is quite faithful to the original stories. It served as my introduction to Nero Wolfe and I think it’s fantastic. There have been other tv adaptations in America and internationally, as well as two forgettable movies in the thirties. The Stout Estate authorized Robert Goldsborough to continue the Wolfe saga with mixed results. And several authors, including Glen Cook, Lawrence Block and Loren Estleman have created detectives that emulate Wolfe. Stout, who was a Baker Street Irregular and a MWAA Grand Master, stands among the finest mystery authors of them all. One of the strangest transitions for any actor to make (apart from when Jon Pertwee of ‘Doctor Who’ fame then decided to play loveable scarecrow Wurzel Gummidge in the childrens’ series of the same name) was that of Willliam Conrad. 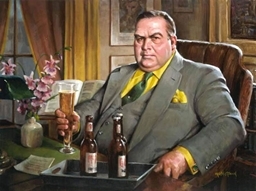 Conrad had become famous for playing a hardbitten PI in the 70’s series ‘Cannon’, only to then take on the role of Nero Wolfe. The characters only had two things in common. Both were on the tubby side, and both sported facial hair – Cannon had a handlebar moustache, Wolfe had a beard AND a moustache. The series only ran for one season. That William Conrad show starred Lee Horsley as Archie. He went on to fame as the cheesy Matt Houston. There was a 1959 tv pilot called The Fat Man: The Thirty-Two Friends of Gina Lardelli. It was mostly based on The Fat Man radio show (which I enjoy). They made the Fat Man more Wolfe-like and gave him an assistant. The guy actually would have made a pretty good Archie Goodwin. It’s not too bad for a 1959 tv show and definitely has a Wolfeian feel to it. It did not get picked up, however. I’ve only read the first two books. I enjoyed them and hope to read more. Stout’s bridging of the Golden Age/hardboiled gap is with the paired detectives is such a great conceit. The Chaykin/Hutton show is one of my favorite of the last ten years or so. Thanks so much for this post, Bob. NW and AG are two of my favourite fictional detectives, and I don’t often come across someone else who values them as much as I do. I greatly enjoy Stout’s other sleuths as well, though they don’t quite measure up. @Fletcher – I came pretty late to Wolfe. I was in my thirties when I read my first story and it was like discovering a treasure chest. A few are “less good” than others, but the quality across the entire corpus is just about unequalled in mystery fiction. You’ve got much good reading ahead. @Violette – A lot of Sherlockians are also pretty big Wolfe fans, so I’ve run into several folks who really know the Corpus. Have you listened to any of the audio books, read by Michael Prichard? I’ve got about fifteen and have listened to each at least twice. He does a fantastic job and they’re unabridged. Great for the work commute. Lee Goldberg is an extremely successful screenwriter and author (look him up on imdb or amazon if you doubt me). He’s put up an excellent blog post about writing for A&E’s Nero Wolfe series, which I praise in the post above. Great read. I’ve written pastiches for Sherlock Holmes and Solar Pons. I’m trying, but the style is tough to emulate and I know I’ve got a ways to go. I’ve also tinkered with Nero Wolfe. I think that the sample I put on my blog shows I’ve got some affinity for Stout’s style. I’m not lined up to succeed Goldsborough, but I think I’m getting it. Writing Wolfe is actually quite a bit of fun.